OPIC eligible countries. The primary purpose of any such fund will be to achieve long-term capital appreciation through investments in projects in this sector. Such investments will provide capital for new business development, expansion, restructuring, and privatization. The fund will be privately owned and privately managed. 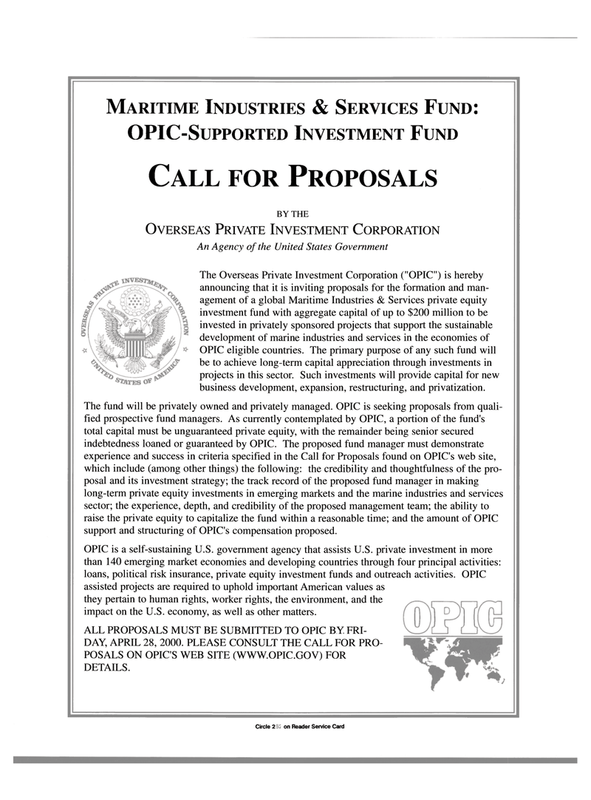 OPIC is seeking proposals from quali- fied prospective fund managers. As currently contemplated by OPIC, a portion of the fund's total capital must be unguaranteed private equity, with the remainder being senior secured indebtedness loaned or guaranteed by OPIC. The proposed fund manager must demonstrate experience and success in criteria specified in the Call for Proposals found on OPIC's web site, which include (among other things) the following: the credibility and thoughtfulness of the pro- posal and its investment strategy; the track record of the proposed fund manager in making long-term private equity investments in emerging markets and the marine industries and services sector; the experience, depth, and credibility of the proposed management team; the ability to raise the private equity to capitalize the fund within a reasonable time; and the amount of OPIC support and structuring of OPIC's compensation proposed. OPIC is a self-sustaining U.S. government agency that assists U.S. private investment in more than 140 emerging market economies and developing countries through four principal activities: loans, political risk insurance, private equity investment funds and outreach activities. OPIC assisted projects are required to uphold important American values as they pertain to human rights, worker rights, the environment, and the impact on the U.S. economy, as well as other matters.